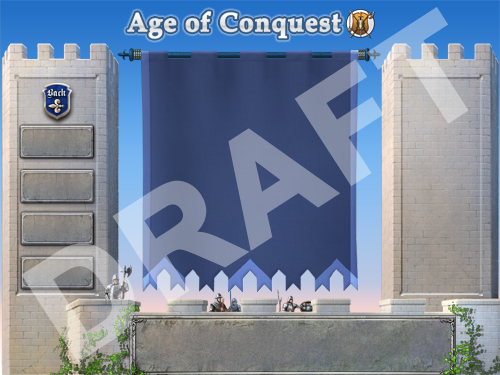 Below is an early draft for the user interface for the menu screens in Age of Conquest III. It’s still a work in progress, so things will be moved around/adjusted as needed. Ah cool. I like the concept of it looking like a castle. Here’s an idea. In the center replace the banner with a big wooden door or drawbridge. Then use the planks of wood on the door as buttons for: Longhaul, Tourney, Blitz, Account, Map Tool, Campaign, Download. Clan or the V3 equivalent. Then it would be like going up the the door of the castle to get inside to play and do things. What do you think? Actually, the goal is to overlay the buttons, information etc. over the banner.